It is never enough for a film just to have great characters, played well by excellent actors, a movie must have a strong story as well. Suicide Squad is an example of this and it isn’t until your are introduced to the Squad that you realise how shallow and weak the central plot really is. The movie hides the one-dimensional nature of it’s plot with it’s flashy, comic-book style which manages to offer a different approach to a DC Universe movie. This film is not a somber, dark and grim affair. This is a film with a comical, cooler undertone which director David Ayer wants the audience to be very aware of from the moment the film starts. This means on-screen graphics, bright neon colours and a very cool use of modern music to soundtrack key moments throughout the film. It all brings a smile to the face and manages to dazzle with appropriate spectacle. All of which is used to good effect in introducing the principle characters. This becomes the strongest part of the movie. The opening twenty minutes when the movie is detailing who everyone is (or at least the important people) makes for the most interesting and entertaining. This is because each of these characters are great. They have involved, deep backstories which you want to know more about. We get the family conflict of assassin Deadshot (and a cool sequence which shows how he was caught), the first on-screen origins for Harley Quinn and the tragic story of regretful gangster Diablo. It is a credit to how interesting these characters, and the few I haven’t mentioned, are that you could very well give any of them their own movie, fleshing-out their origin, and it would be entertaining. This is also down to how well they are brought to the screen by their respective actors. Each actor delivers in this movie. There isn’t a need to go through each one but there are some stand-out stars. Will Smith manages to drive the story as Deadshot, showing some of the charisma and talent which made him a 90s megastar. Joel Kinnaman has the hardest job as non-super Rick Flag but doesn’t get lost in the mix. The movie belongs to Margot Robbie though. Her performance is the best of the film and she is captivating from the moment she is on-screen. 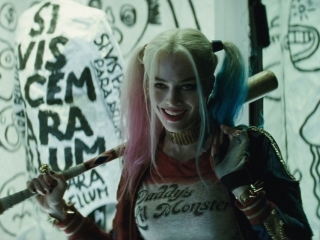 She makes a crazed criminal into a multi-dimensional character and you will want to see her as Harley Quinn more often. 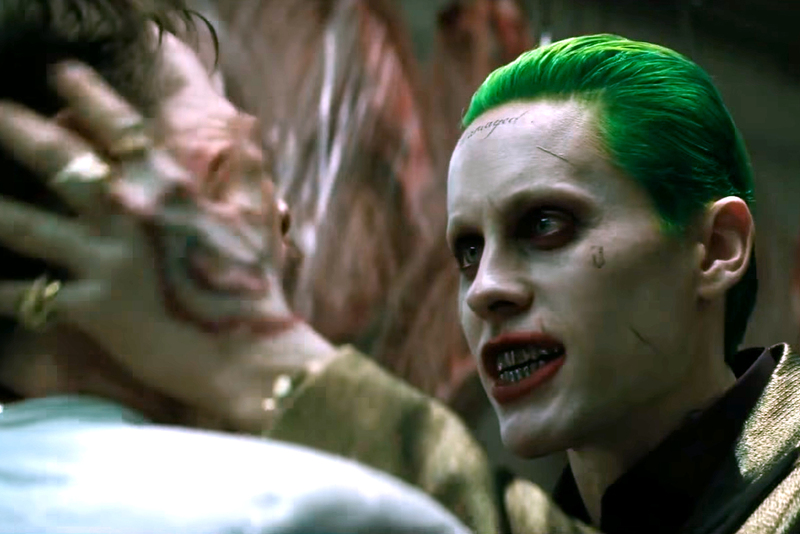 Which makes for a strange comparison to Jared Leto’s Joker. Much has been made of the bizarre activities away from the screen but it hardly makes for an inspired version of the character on-screen. It feels like a mix of many different, better versions of The Joker and almost a caricature of what The Joker is, rather than a definitive version, like Heath Ledger or Jack Nicholson’s. The Joker is also at the center of the strangest choice in the film too. The story is about criminals being used for extreme missions which will probably see them getting killed. Including The Joker would naturally mean that he could be the definitive villain these people team-up against but he is a bit-part player in this movie, popping-up for almost cameo appearances or driving elements of the story forward. There is a different, very CGI and soulless “main” villain instead. It is a villain with very little about them and one that feels under-developed. The issue with trying to bring so many new characters together and make the audience care is that something has got to give and in the case of Suicide Squad it seems to be the overall story. What is left is a simple “get from Point A to Point B and stop the villain” with little to no development in-between. What saves the movie is the smaller flashback and origin story elements. Each time a character’s backstory is explained, the movie becomes so much better. 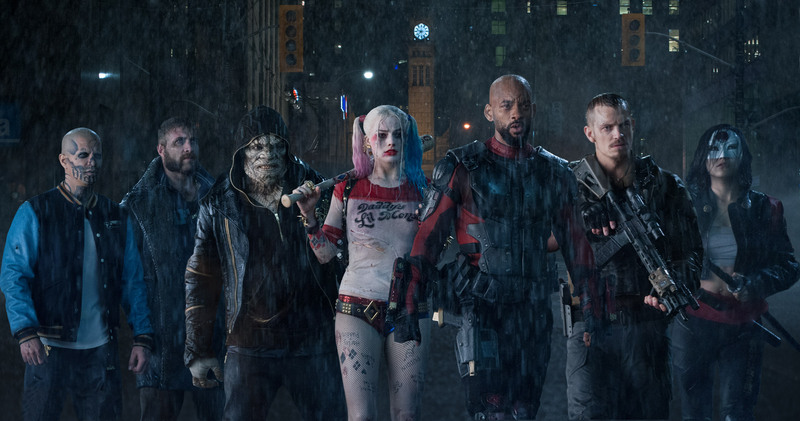 They make for excellent set-pieces and have some of the coolest moments, particularly anything involving Will Smith’s Deadshot or Robbie and Leto together as Harley Quinn and The Joker. Overall, Suicide Squad is an ambitious attempt to bring something different to the DC Cinematic Universe and it succeeds in a lot of ways. The characters are great and the performances match them, particularly Smith and Robbie. The origins are interesting and the looks of the movie is unique. Unfortunately, once they are a Squad, there is very little of substance for them to do and the thin plot is too apparent. Nice review, glad you liked it and I think I probably will give it a favourable review too, so many people seem to echo what you said about the villain which is a shame but the ensemble element seems to be what makes it fun, can’t wait to see Leto, Smith and Robbies’ performance in it. Previous Previous post: Countdown to Review 500!